jobEQ - iWAM Options and Details � Model of Excellence, Comparison Reports and More! We create a personalized Closed User Group on the jobEQ Web site, where you can send people (jobEQ HR tools include an e-mail invitation service). The CUG can be branded for any organization, with custom logo, color scheme, and a short title on each page. Apart from the end-users who have the right to ask to access their personal data, only authorized staff can consult tests filled out in your closed user group. You also get an access to the customer HR environment, where you can retrieve listings of persons tested, generate full reports, etc. The price for system setup includes the first 5 management reports. An explanation of the 16 categories first in general and then in detail for this person. The patterns that typify the person the most and discusses some combinations of patterns. How the person would perform at various job types, linked to management, administration, and customer oriented functions. Strategy on how to manage this person. Optional: when you also use the jobEQ feedback service, we keep you informed about questions, remarks and further test discussions between jobEQ and the individual. Do you want to compare multiple candidates for a job? This tool compares a series of persons to a reference model and ranks them by how well they fit the reference model. Based on the model of excellence, we can predict what language will motivate candidates. This information can be used for improving the quality of your communication (e.g. job ads). Our help desk offers you (and your recruiting or advertising agency) the necessary assistance for implementing these recommendations. 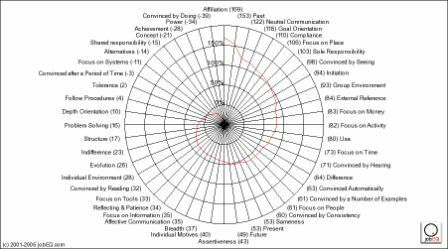 The Attitude Sorter ranks the 48 iWAM patterns from “high” to “low”. The report displays the 8 highest patterns and the 4 lowest and explains the consequences in terms of personal strengths and development areas. This report is an ideal tool for coaching purposes. Compares the iWAM results of 2 people (using many of the patterns or just the 5 most similar/different). View people side-by-side. Preview how a team would behave, who has what strengths, and how the group would communicate. You can compare the people you want and even show a standard group (optional). If there is a reference model, the team can also be compared to that model. jobEQ wants to offer the end-user more, thus contributing to the positive image of your organization. You decide whether or not jobEQ gives the end-user a feedback report after filling out the test. One day of basic training is recommended for understanding the principles behind the iWAM test. More training is required to become a certified iWAM consultant: Four days of training is standard, while those with a background in LAB Profile will require less. This training is adapted on your specific needs and is based on the knowledge we have about your company and the function-references that have been developed. This includes iWAM-related training as well as additional services, such as action oriented coaching and COMET-based services. We invoice the training fee as well as iWAM license rights. We offer HR consultancy services related to work attitude and motivation.